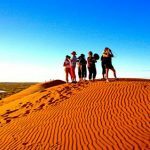 Camping under the stars in the middle of Australia’s most famous desert, journeying over rolling sand dunes and the iconic Birdsville Hotel are highlights of a Simpson Desert tour this August offered by outback tourism company, Tri State Safaris. Savings of up to $2100 and a solo supplement of just four per cent are now being offered for bookings made by April 30, 2018. 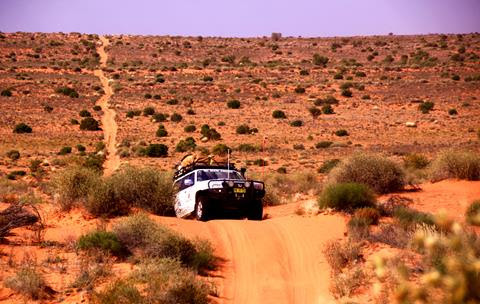 The new, off-the-beaten-track, 12-day adventure will take guests across the rugged outback landscape, with travellers able to ride in custom-designed, air-conditioned 4WD vehicles or bring their own 4WD vehicles on the tour. The ‘Simpson Desert Adventure’ tour will depart from Tri State Safari’s base in Broken Hill in far west NSW on August 13, 2018. The tour is a round-trip, outback journey across three states – NSW, QLD and SA. Features include the vast, salty expanse of Lake Eyre – the lowest point in Australia, the remote outback hamlets of William Creek, Innamincka and Oodnadatta, the opal mining town of Cooper Pedy where guests will stay in an underground motel, the three-state meeting points of Poepell Corner and Cameron’s Corner, the famous pub and camel pies of Birdsville and the ever-stretching, rolling dunes of the Simpson Desert. The tour includes visits to outback bores and memorable, middle-of-nowhere desert camps with campfire dinners under the stars. More than half the size of Victoria, the Simpson stretches for 170,000 square kilometres, with its largest sand dune Nappanerica, commonly known as ‘Big Red,’ soaring 40m high, with guest on the tour able to stand at the top to take in the views. Fares includes accommodation and meals. Tri State Safaris is owned by Out of the Ordinary Outback, an expanding tourism business in far west NSW which also owns seven properties- The Alma Hotel and Argent Motel in Broken Hill, Warrawong on the Darling tourist camp and cabins at Wilcannia, the famous White Cliffs Underground Motel, Cobar’s Copper City Motel, the Ivanhoe Hotel and the soon-to-open Broken Hill Outback Resort. Out of the Ordinary Outback’s own visitor centre also operates in Broken Hill.